A cleaning crew working at the home of an Atlanta neighbor saw me in my yard and (not knowing that I owned an Atlanta Maid service) asked me if I would like one of their business cards. In a feeble attempt to sidestep my question, I was told “Well I did have insurance, but it got really expensive….so I had to drop to keep my prices down”. No insurance? If the price is significantly cheaper, it may sound really good. But think about it. If a “company” or individual can’t afford insurance, can it afford to cover any possible damages to your home that might occur? Even worse, don’t you think he or she will sue you if they get hurt on your property? And what are the chances that she will still be around 6 months or a year from now? That she has proper training and equipment? You really do get what you pay for. Most consumers never ask about insurance. You should! And, request a copy of the insurance certificates before you contract any service. Peace of mind is worth a little extra money. Atlanta’s oldest and most reputable independent maid and house cleaning service. The best cleaning tool ever! One of the best cleaning inventions ever, in my opinion, is the steam cleaner. We often use them in our top to bottom detail cleanings and they do a terrific job. These small machines heat surfaces with dry steam that not only cleans effortlessly, but also kills fungus, dust mites, bacteria, and viruses. Cleaning solutions are not even required. The best steam cleaners are ones that use water heated to a temperature of 240 degrees or hotter. The one we use is the McCullough Steam Cleaner that I got from Target.com for about $140. We have used them successfully to clean baseboards, woodwork, countertops, bathrooms, tile, and inside the fridge and oven. And, there could not be a greener, more environmentally friendly cleaning tool out there! For lots of hard surface floor vacuuming, I highly recommend a Eureka Mity Mite floor vacuum! 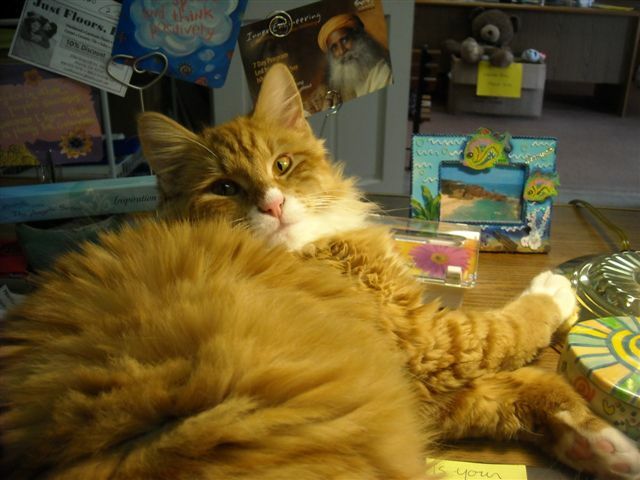 I am a confirmed pet lover with a big shaggy Great Pyrenees, Sam, and a big orange puff-ball cat, Simon. As any pet owner will tell you, pets add so much to our lives. They are endlessly interesting, curious, affectionate, and just plain fun. Yes they are sometimes expensive and sometimes a lot of work, but absolutely the benefits outweigh the negatives! Having a pet contributes to happiness too. It is hard to feel really grim when your dog is jumping around in crazy circles just at the sight of you, or your cat is purring away while licking your toes! Plus, having an animal, especially a dog, gets you OUTSIDE! Getting outdoors every day in nature for even just a few minutes, is vital to our well being and nourishes our spirit, in my opinion (actually not just mine, there are lots of scientific studies to corroborate this too). And, walking your dog makes it easier to connect with other people too – another happiness booster. However, one downside to having a pet are the extra dust bunnies and pet hair. If you have allergies this can be a lot to keep under control. Invest in a good vacuum, preferably one with a hepa filter. If you have a lot of hard surface floors, I highly recommend a Eureka Mity Mite floor vacuum. It works SO much better than using a broom or even a swifter. In our Atlanta maid service that is all we ever use for wood and tile floors. Or, if you want us to do it for you (and make life even happier!) call us – Sponge & Sparkle Cleaning Service at 404-633-9652. A few weeks ago we cleaned the home of one of our newer regular Buckhead clients – a lovely young couple. They were getting married in a small, simple ceremony in their home that afternoon, before heading off to Mexico where they would honeymoon and recite their (unofficial) vows on the beach. Being friendly with their cleaning team of Sam and Caprice, and knowing that they were husband and wife, the husband to be asked Sam if he had any advice for them. “I sure do” Sam said. “Study her“. Sam said, “Study her! Learn her! Find out what makes her happy, sad, and angry. Then leave sad and angry alone! To sum it up, in other words, just love her”. What profound words were given to this couple by our cleaning crew that day. Just an extra bonus to go along with the sparkling clean house!